So it turns out Americans love fried chicken, melted cheese and bacon. 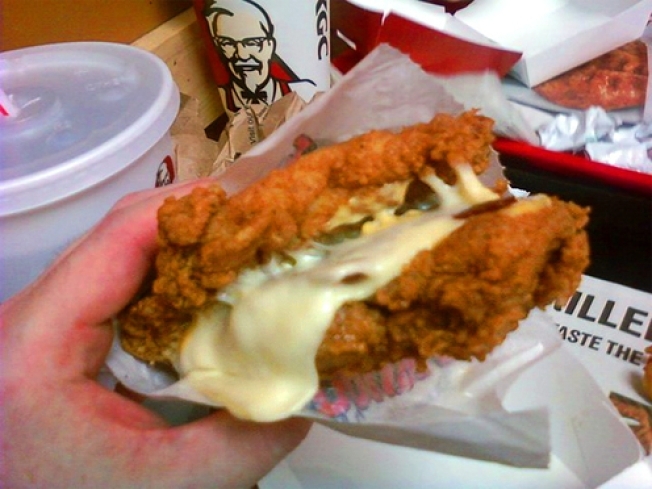 KFC's Double Down sandwich may have been ridiculed by high-brow foodies, but regular folks are gobbling them up. The chain says it will keep the no-bun sandwich going past the planned end date of Sunday and for as long as demand remains high. The sandwich's main appeal, aside from the obvious one of delicious fried meats, is its unabashedly gluttonous makeup. After it debuted on April 12, it quickly became a viral-marketing sensation. People posted videos of themselves eating the sandwich on sites like YouTube, and celebrities like Stephen Colbert scarfed it up on TV. KFC said it has been one of its most successful sandwich launches ever, with nearly 10 million sold at just under $5. Some have questioned the sandwiches' nutritional value. The original version has 540 calories and 32 grams of fat, and 1,380 milligrams of salt. A grilled version cuts calories to 460 and fat to 23 grams, but sodium rises to 1,430 milligrams. By comparison, the Big Mac from McDonald's has 540 calories, 29 grams of fat and 1,040 milligrams of sodium. The American Heart Association says people should aim to eat less than 1,500 milligrams of sodium a day.